Winnebago – Jean Etta Sherman, 102, of Winnebago, died Monday, February 4, 2019 at Prairie View Assisted Living Community in Winnebago with her family by her side. Born January 30, 1917 in Rockford, the daughter of Frank W. and Frances M. (Billings) Valentine. She graduated from Rockford Central High School in 1935 and then worked for the American Insurance Company in Rockford. Jean married Clarence Frederick Sherman on December 19, 1939 in Rockford. Jean farmed with her husband Clarence on the home farm 68 years before moving to Pecatonica. 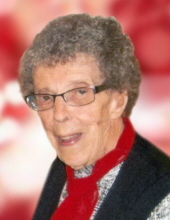 She was a member of St. John Lutheran Church in Pecatonica, Westfield Community Center and Home Extension for over 50 years, Alpine Senior Center, Winnebago County Farm Bureau, Winnebago Grange and volunteered as a Pink Lady at Rockford Memorial Hospital for 20 years. Jean and Clarence enjoyed traveling together and with neighbors Mary and Emil DeGarmo. She and her twin sister, Janet, attended many twin conventions winning trophies for the oldest twins in attendance. On Monday afternoons you would always find Jean at the table at Prairie View Assisted Living ready to play 500 and thoroughly enjoyed playing games of any kind. Jean is survived by her daughters, JoAnn (Neil) Tate of McClure, PA, Barbara (Jerry Palm) Falk of Winnebago; daughter-in-law, Kendalyn Sherman of Winnebago; grandchildren, Diana (Gerald) Baca of Albuquerque, NM, Carrie Falk of Pecatonica, Christopher (Jennifer) Falk of Dripping Springs, TX, Kevin (Holly) Sherman of Winnebago, Jeff Sherman of Winnebago; great-grandchildren, Erika, Emma, Hannah, Greyson, Jacob, Alex, Colton, Brennan; several nephews and nieces. Jean is predeceased by her husband, Clarence F. Sherman; son, Clarence “Butch” H. Sherman; son-in-law, Robert Falk; great-grandson Connor Falk; brother, Herbert Valentine; sister Marion Miller; twin sister, Janet Flemming. Funeral service 10:00 a.m. Saturday, February 9, 2019, with a visitation starting at 9:00 a.m. at St. John Lutheran Church, 1301 N. Jackson St., Pecatonica with Rev. Terry L. Theiss officiating. Interment at Willwood Burial Park in Rockford. Arrangements by Genandt Funeral Home, 602 N. Elida St., Winnebago. In lieu of flowers a memorial will be established. For an online obituary and tributes go to www.genandtfuneralhome.com. "Email Address" would like to share the life celebration of Jean Etta Sherman. Click on the "link" to go to share a favorite memory or leave a condolence message for the family.